When I was in middle school a new pastor accepted a call to our church. He liked to play guitar and taught us a song about Noah's Ark called "Arise and Shine" (Children of the Lord) with lots of silly verses including "The Lord said to Noah: There's gonna be a floody, floody; Get those children out of the muddy, muddy; Children of the Lord." The song is fun to sing for children but because of the lyrics, it is one of those songs that a child could easily get made fun of by their non-religious friends for singing, for showing their faith. All kids worry about what their friends think of them and try to avoid getting laughed at by their friends. The newest VeggieTales DVD just released on August 4th called Minnesota Cuke and the Search for Noah's Umbrella addresses the issue of confidence around friends and teaches children to do the right thing and not worry about possible ridicule. In this episode, Larry the Cucumber stars as Minnesota Cuke, the curator of the Mooselake Children's Museum. A rich man named Humfrey Muffet sends Cuke on a quest for Noah's Ark. Muffet wants the Ark for his Bible-themed goldfish pond. Cuke, along with his friends Martin, Julia and Professor Rattan, work to locate the Ark and learn of the existence of a supposedly powerful "Noah's Umbrella." Following clues, Cuke journeys to the pyramids in Mexico and later to Turkey and overcomes tests and hardships. Rattan's evil twin brother named Wicker knows of the quest and tries to find the location of the umbrella and Ark before the others. The accompanying silly song for this episode is titled "Sippy Cup." 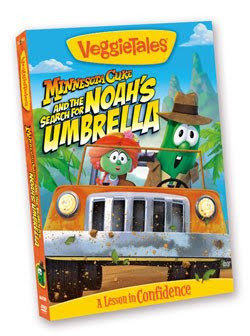 Minnesota Cuke and the Search for Noah's Umbrella is an Indiana Jones inspired episode, much like the earlier VeggieTales adventure, Minnesota Cuke and the Search for Samson’s Hairbrush. Minnesota Cuke is overly concerned about what other people think of him. The show relates the following message: "God promises He will give us the confidence to do the right thing," despite what others may think. It is important to have faith in God's plans, just like Noah had great faith when he built the Ark. The applicable Bible verse discussed at the end of the film is Proverbs 29:25 - "Being afraid of people can get you in trouble, but if you trust in the Lord, you will be safe." This fast-paced episode full of adventure and suspense will keep kids interested. 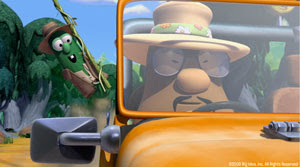 Like the other VeggieTales episodes, the adventure includes plenty of creative and witty remarks. For example, one of the cities Cuke visits is called "El Pez," the ancient city of candy dispensers. For those interested in incorporating bilingual studies, parts of the episode feature Spanish words and phrases, especially the song "Mexican Ice Cream." And, to my delight, the song "Arise and Shine" plays a big part in the show. I have a feeling VeggieTales has another hit on their hands! This post was written for Family Review Network as part of a program for Big Idea and VeggieTales, who supplied the DVD for review. Well if that doesn't look like some fun video watching...thanks! I love Arise and Shine! I always sing it to my husband when he has to get up. He doesn't appreciate it as much as I do!